Last October I joined the team of volunteers at the GSoA archives working on the Home Front Project. Delving into the lives of students attending the School during WW1, the aim of the project is to create a record of home front activities, such as fund raising and voluntary work, and where possible, to look at what the students went on to do and whether the impact of the war influenced their career choices or the art they produced. This record will compliment the Roll of Honour research project, completed last year, which shed light on the lives of the students and staff included on the roll who had contributed to the war effort by serving in the forces or working as nurses. 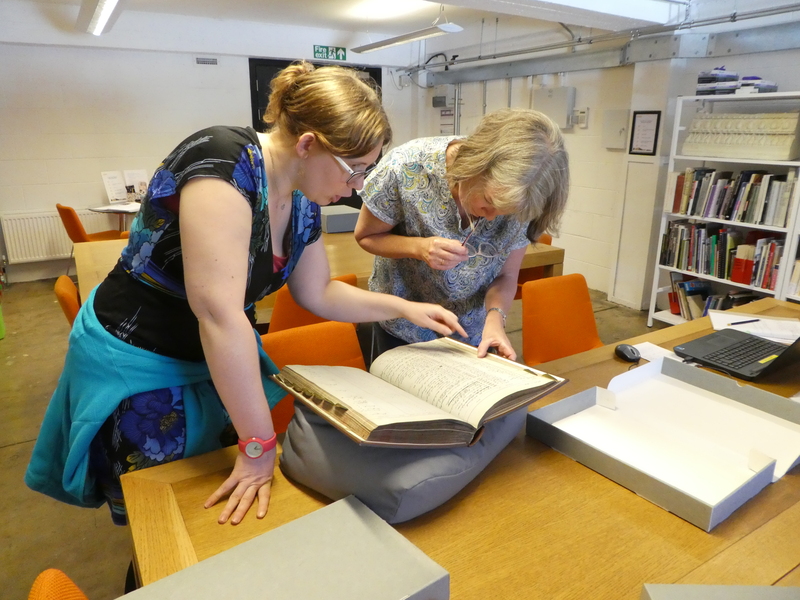 Kay and Lucy doing some Home Front research from our Student Registers. I must admit I felt slightly daunted by the list of names I was allocated – all the ‘C’s. Were there really so many students who shared the surname Campbell?! Working with little more than a name, a date of birth, the address given on registration and anything gleaned from the records about courses studied, prizes won or bursaries awarded, it is quite a challenge to piece together a life from birth certificates, census data and contemporary Post Office directories. Evening students often have an occupation recorded too, and some job titles provide a useful lead. Others though, like “box cutter”, just add to the mystery. Two entries on the list immediately caught my eye – Sister Callista and Sister Campion. Obviously as nuns they did not give their family names and did not provide birth dates; the only personal detail recorded in the School Register was their address, Notre Dame Convent, Downhill. Where to start? The two Sisters first enrolled at the School in 1914, do not appear on the list for the 1915-16 session, then attended every year from 1916-17 to 1918-19. Sequential registration numbers suggest that they always enrolled together and we can see that they followed the same courses, including studying metalwork with Peter Wylie Davidson, Assistant Master of Decorative Art and Metalwork, for at least two years. Sister Callista was clearly a gifted student and won the Mrs D Macleod prize for enamel and silversmithing in 1915. A quick online search for Notre Dame Convent provided a little more information about their home. In 1894, four Sisters from the Liverpool Notre Dame College were sent to Glasgow to found the first Catholic teacher training college for women in Scotland. They bought east Dowanside House, Dowanhill as their convent and purchased the remaining half of the house a year later when they accepted the first students to the new college. In August 1897, The Downhill Higher Grade Practising School opened, (a practising school was an essential part of a teachers training college at that time) starting with just 24 pupils. This grew rapidly, and a chapel and further classrooms were built in 1900, but within a few years, even more accommodation was required. By 1912, the school roll had risen to almost 200 pupils. Read the next instalment soon!